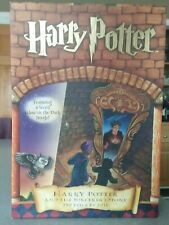 Harry Potter Bepuzzled Puzzle #31351 Year 2000 New! For your consideration is New in Box Bepuzzled Harry Potter and the Sorcerer's Stone Magic Puzzles. This box includes the following: 2 Two-Sided 7"x7" 81 Piece Puzzles, 1 Two-Sided 7"x7" 60 Piece Puzzle, 1 Two-Sided Magic Spinner Disc, 2 Magic Spinner Disc Nibs, and 10 Magic Mind Reading Cards. 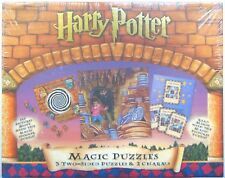 New Bepuzzled Harry Potter Magic Puzzles (#31351, 2000). Harry Potter Magic Puzzles Jigsaw. Harry Potter "Beware Fluffy!". Features a secret glow-in-the-dark image. New in sealed box - box has minor shelf wear; price sticker residue, and light scratches (see photos). HARRY POTTER AND THE SORCERERS STONE 250 PIECE JIGSAW PUZZLE WITH A SECRET GLOW-IN-THE-DARK IMAGE. 2000 New Harry Potter and the Sorcerer's Stone. Featuring a Secret Glow-In-The-Dark Image! 250 Piece Puzzle. In Harry's world, magic is everywhere. Using illusions and puzzles, he can share a little of his supernatural fun with you. Featuring three two-sided puzzles and two charms, this box is perfect for amateur sorcerers. HERMIONE GRANGER AND THE SORTING HAT. HARRY POTTER. 250 PIECE PUZZLE. FEATURING A SECRET GLOW IN THE DARK IMAGE. The box is still sealed, it has never been opened. 2000 - Be Puzzled - 31361. Harry Potter and the Golden Snitch. JIGSAW PUZZLE.